Strawberry trees (arbutus) are among the most beautiful evergreen trees. In fact there is not much competition because moderate-sized evergreen trees are not that common. The mind immediately turns to eucalyptus and conifers but they can become monsters and do not suit all gardens. There is photinia ‘Red Robin’ too, though that has become almost too ubiquitous and I am no fan of the other photinias (often still known as stranvaesias) either. So arbutus are very useful. There are a dozen species, that have a strange distribution, being found in North America, the Mediterranean and western Europe including, in one of those strange quirks of remnant vegetation after the last ice age, in the Burren in western Ireland, a thousand miles from its nearest natural population. A look at the blooms will suggest that the heather-like flowers belong to the Ericaceae. 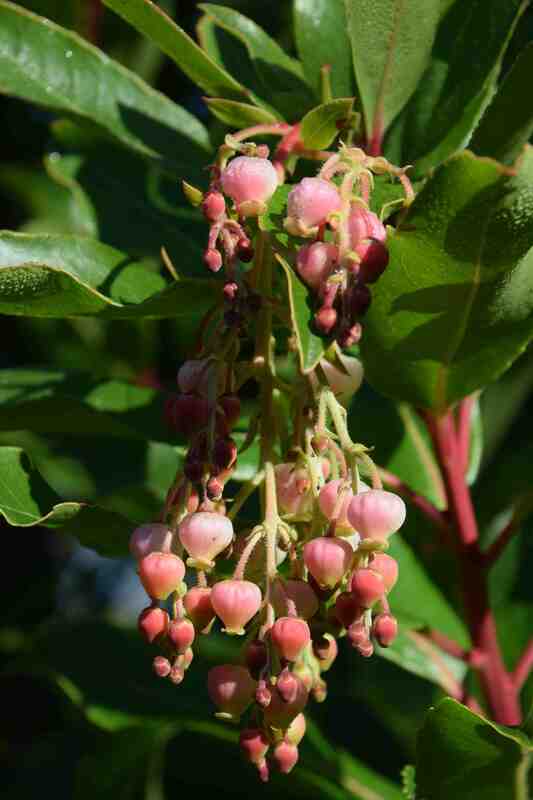 Arbutus are all evergreen with clusters of nodding flowers in shades of white or pink and often with attractive, peeling bark. A nice feature is that the fruits, which are round and ripen to gold, orange or red, are at their ornamental best when the flowers are open, usually in late autumn. 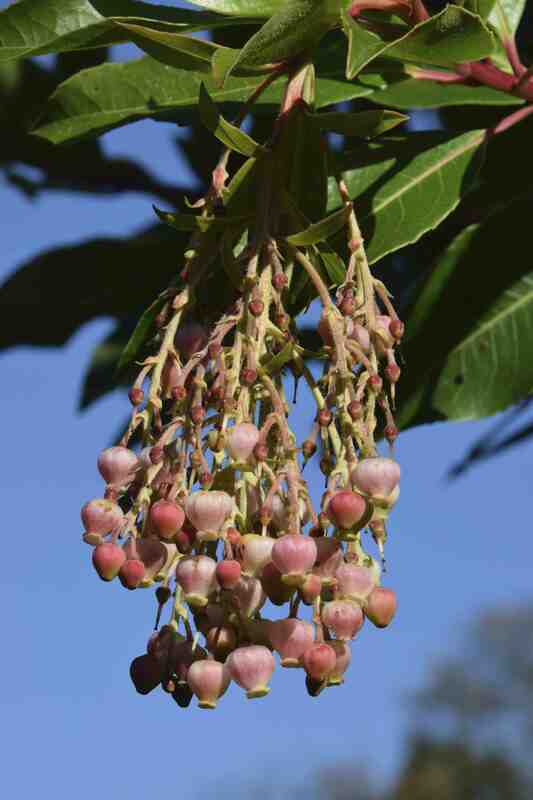 The most common species, and the one found in Ireland, is Arbutus unedo. The species name means ‘you eat one’ which is appropriate because that is the number you are likely to eat. Though sweet and not horrible, they are grainy and mealy and only likely to be a big part of your diet if you are starving. Though attractive and unusual in being lime-tolerant, Arbutus unedo is surpassed in beauty by other that have better bark. All have smooth bark that peels and is usually in shades of green and cinnamon but A. andrachne (from Greece among other places) is much more beautiful, along with the hybrid A. x andrachnoides. But I was very taken with ‘Marina’ which I saw the other day because of its abundant and very showy flowers. This hybrid has something of a mysterious origin and is thought to be a hybrid of A. x andrachnoides and A. canariensis although it may be a selection of a very good A. x andrachnoides. It is thought that the original tree was sent from Europe for the Pan Pacific International Exposition in 1915 but was then sent to Strybing Arboretum from which a cutting was taken and grew at the Western Nursery in Lombard Street in San Francisco. The Strybing Arboretum bought the plant in when the nursery closed and a Victor Reiter was allowed to take a cutting in 1933 and the plant grew in his San Francisco garden until it was discovered and propagated by the Saratoga Horticultural Foundation and it was made available for sale in 1984. So although this tree is almost certainly almost a century old, it has not been in the trade long and is almost a ‘new’ tree. Arbutus are not difficult plants to grow and they should be good coastal plants but they do grow slowly and when you buy a plant it will only be the size of a small shrub. But they do flower and fruit when small. In general they do not like waterlogged soil, flower best in full sun but plants do benefit form shelter from severe cold and wind when young so they do need a bit of extra care at first. ← Wonderberries or waste of space? ☺️ I have been meaning to get an Arbutus for some time now, so will take this on board, thanks. No doubt would have to order from somewhere in UK though!